Thanks for the info on where to look for the silver getter material. It looks like you said: buried right down at the bottom of the base where the pins come out. It's hard to see, but I think I see it. BTW, in you're opinion, are the Bendix 6101 sonically the same as the black plate RCA 5Y3GTs from the 50's or are they better? I ask because I found them at this Turkish link for $39.00 each and I'm wondering whether it's really worth spending another $80-90 bucks for another pair. I'm sure I can find a U.S. retailer if it's really worth the effort. That SRPP circuit is a tough baby for the driver tubes in the CSP2+ and 3. I think that's part of the reason Steve designed the preamps around the 6N1P-EV tubes. Amperex 7308s seem to work well, too. It seems that the Russian tubes and American/European 7308 class tubes are what's needed for the drivers. Also, thanks for the link to the black knobs, I've bookmarked it for future reference. I could have used it before I got the 8 silver knobs from Parts-Express. I completely forgot to look at DigiKey. But, I am tempted. My RCA 5Y3GTs light up fast like yours do and that's why I asked the question. I thought indirectly heated tubes were supposed to lite up slowly to protect the outputs tubes. By slowly, I mean several seconds (maybe 10 sec or more) so that full current isn't passed to the output tubes before they have had a chance to warm up/ fully turn on. I believe this is to avoid what's called "cathode stripping". However, in my readings I have learned that cathode stripping in audio gear is really a non-issue at the lower voltages we are dealing with in audio amps. I posted about it in the Taboo III forum. noisy. I guess I'll just stick with the stockers for now. I believe that I burned in my Bendix 5Y3s for over 200+ hrs. Mine were from the same Turkish seller u mentioned. I bought 2 from NOS tube store some time back when I was still tube rolling the rectifier section of the CSP2+. Sonics wise, the 5Y3 either Tung Sol or RCA sound much better in an organic way. The Bendix sounded too SOLID State too me. Maybe I have to burn them in for 500+ hrs? Anyway I finally gave up on these tough critters. At 200+ hrs, the Tung Sol 5Y3 still sounds much better in the mids. My RCA 5Y3GTs light up fast like yours do and that's why I asked the question. I thought indirectly heated tubes were supposed to lite up slowly to protect the outputs tubes. Sorry, I thought I was answering this, but realize it was obscure. I don't think the RCA 5Y3GTs you or I have are indirectly heated, whereas the Heintz and Kaufman 5Y3WGTAs are. These by the way are the same tubes as the Bendix from the NOStubestore, but the Heintz were cheaper not having the Bendix label. I remember liking them a lot at one point, but last tube set I listened to them in, I would agree with LS for the most part. The RCAs in that test were more organic and textural. I tend not to use the 5y3s. I like their tonal qualities, but always lose out with their lower power and reduced dynamics compared to 5U4G, 5R4GY, and 5AR4s. I am really impressed with how tubes show up with the CSP3. It is fun to hear how clearly it reveals their qualities while keeping its special signature alive and well. The output stage is really something cool, and the Jupiter caps.....very nice. So then I check this thread and now I see there's been some discussion about the circuit needing really strong tubes. I guess the Gold Lion is on the "no good" list. So it's back to the 6N1P-EV stockers for now on the output. I got my super Cryoed 6N1P-EV matched pair from Cryoset.com. I think Lon over here has dealt with this tube seller too. Cryoset is one of the reliable non-bs kind of seller. As LS has noted, I've dealt with cryoset, very favorably, for years. Excellent tube vendor. I use their "Super Cryo'd" 6N1P in my CSP2, CSP2+ and Torii Mk III components; 6N1P is the tube type that offers the most sonic improvement for me in my system, have tried most of the others that can be used and don't prefer therm. The cryo'd tubes can take a few hundred hours to really be all they can be. I have bought loads of tubes from cryoset. Really good guy. Also I have tried many 6922, 6DJ8, 7DJ8, an E188CC, and even had one pair of NOS Ediswan 6BQ7A make the dreaded popping, though some other 6BQ7As hum, and several work fine, especially if I lower the voltage going into the CSP3 below 120 and have a very quiet 6 type in the input. It seems that hum may be the almost works phase. The same tubes are fine in the Torii inputs so I assume it is the SRPP output circuit of the CSP. I even got some NOS Siemens E288CC on LS's recommendation, and no popping, but I can barely get sound out of them. Any thoughts ...bad tubes? They fire up in a pretty quiet way, and really do look NOS. I am not sure what constitutes a "strong tube" but with my CSP3, it seems to be a crap shoot at best to use anything other than the 6N1P in the outputs. I would love to hear more about "strong tubes". From my experience, only perhaps the 6BQ7A should even be referred to as an option on the output section, which luckily is an inexpensive tube, so if the pair does not work, it is not a great loss. Now I have in my CSP2 3 E188CC philips and one GE 5UAGT and everything is OK no noisy no popping and sound very good. Yesterday I receave a quad of 6N1P-EB from Russia they are from 1972 made in novosibriaski factory (20.00$ include shipping, I givve a try) (people said the best) I put in my tester and test strong. Tomorrow I will try in my CSP and see. Sounds like some really good tubes Francesco, great, let us know how they sound. Thanks Lord Soth, Lon, Will and Francesco for the flood of useful responses. I have no experience with cryoed tubes, and therefore don't have an opinion formed on any sonic differences. However, the word from you folks that this a reputable source for a premium matched pair is good enough for me. I guess that the cryo process at least weeds out tubes that may be structurally questionable because I imagine anything kind of frail or questionable wouldn't survive the process. I'm sure that getting a pair or two from cryoset and just using those in the CSP3 will save money in the long run, as I'm not burning up expensive sets of tubes. So I'll order some up. Thanks again. Speaking of burning up tubes, sorry didn't get an answer but could my fresh matched pair of 6922's have been damaged? I hope not. I would bet that your 6922s are fine. without noise, particularly in the right channel. I didn't get any popping sounds, but it was obvious that they weren't the best choice for outputs. I have tried each one in the input position, and they worked fine, so no apparent damage. balance shifting to the left channel. I sent the right channel tube back to be replaced. The seller called me and said that the tube had completely shorted, and it was the only one of that type that he had seen do that. He replaced the tube (NOS) under warranty, but said that he would not do it again due to the circuit being originally designed for a 6N1P. and they are sounding great. I'm done rolling the outputs. Sooooo, in my experience, the output positions are VERY tough on the tubes. Choose carefully if you decide to roll them. I'm equally surprised to hear about your experience with the Siemens E288CC. The choice of rectifier might have have something to do with it. I'm using a 5R4GY which is stronger than a 5Y3 but weaker than a 5U4. Maybe that is the cause? My E288CC are a strong matched pair producing 30mA readings vs the usual 15mA reading for a typical 6DJ8 tube. (BTW, for any tube newbies reading this , this behavior is expected). I'm getting a louder output from my CSP2+, which is consistent with theory. Or maybe the CSP3 does'nt play nice with the E288CC? I'll expect to receive my CSP3 before the end of this month so I'll be able to confirm the usage ( or lack thereof) of the E288CC very soon. Thanks Lord Soth. I will experiment with rectifiers. I am using a 5U4G-ST now. Based on you explanation it is odd that these E288CCs are very quiet with this current setup...I will report back. and no hum no noise, nothing. Sounds good Francesco. Looking forward to your thoughts. I tried a Valvo 274B, a Westinghouse labeled RCA 5U4G-ST, a Philips 5R4GYS, a Chatham 5R4WGY, and a Heintz/Kaufman 5Y3WGTA. All no luck with these tubes labeled E288CC and claimed to be Siemens by the seller. They are cool looking tubes...like a 6-type but 1/4 or so taller with the extended area above the getter...gold pins, grey plates, and the hallow getter has two supports, angled a little outward, symmetrical, and passing through a shiny plate that is a bit above the top mica. One getter support has a silver "shield." They play very quiet at full volume on the Torii with the CSP3 set as usual, but also full on the volume pot. They act similarly in the input position of the Torii. Both channels act the same. It will be interesting to see if your E288CC work in your coming CSP3. If mine is an accurate example, it is a great sounding pre to me, and good for tube changing, but with the output limited, not totally a tube rollers dream. I am however getting sound I like quite a bit with some 6BQ7As. I like some 6N1Ps quite a lot in the output, but at this point, using them may lack a bit of character to me, particularly in subtler presentation of spaciousness and micro information. At least at my very green stage of exploration, I prefer the more delicate/complex sound of some European 6BQ7As. BTW, the Ediswans that did the bad stuff on first try, are fine with a 5R4G or the 5Y3 in...have not checked it with the 5U4 yet. Or it may be to do with the input tube. All a little quirking to me. Oddly, at some times the same tube set with the Brimar 6BQ7As I have can sound noisier than at other times... the outputs appear to be quite touchy electronically. For experimentation, I did have the CSP3 plugged into my Uberbuss, and that seems to keep a constant 120 volts by my meter. Edit: I tricked myself. Every time I checked the Uber over the last several days, it read 120. I just checked and it read 122.3! So the Uber does not likely control voltage, just happened the grid was consistant (at least at the moments I checked it). So voltage in does appear to be part of the quirkiness I am finding with some 6BQ7As. Then, to play with the voltage, I plugged a Variac into the Uber. Then an Audio Brickwall (modded with a good receptacle and AC plug) into the Variac. And finally the Torii and CSP into the Brickwall. Now I can play with the voltage on both at once. Lowering the voltage a bit so far seems to have some benefit on 6BQ7A noise. I by no means have a handle on this pre yet. And of course it works flawlessly with 6N1Ps in the output positions. I just love the refinement one can get adjusting the sound with tubes, so I am messing around until I can get a call in with Steve. Soooo...does that mean it may be possible for me to try the Genalex 6922 in the output again with a different rectifier? I was using the Philips 5R4GYS when they made bad popping sounds. I have several rectifiers on hand, the Decware supplied Valve Art 247B and a 5U4G, then a Mazda 5Y3GB, RCA 5Y3GT, and the aforementioned Philips. It is all too mysterious for me...too close to some edge or edges. I am now back to the GE/RCA 5U4G-ST and the Ediswan 6BQ7As are being very civil, with just a little hum, ear close to the speakers. My variables I can discern seem to be mostly voltage from the grid as far as I can guess at this point...but I wonder. When I first put in some Brimar 6BQ7As they too were noisy, but not that weird, repeating, building steam to popoff sound. Then they seemed to get better the next AM (perhaps the next AM voltage was lower???). I ran them a while, and all seemed well until late the next night when they got a bit noisy. This is when I thought of playing with the Variac/voltage. But maybe tubes that are close need some time in the circuit for some reason as well. That said, different rectifier types sure effect the sound a fair bit, so are bound to be effecting the power to the other tubes in some way..voltage or amperage or both. So exploring the different rectifiers may help. I could not get a single 6922 to work in mine when I first tried it, but that was I think with the Valvo 274B in. 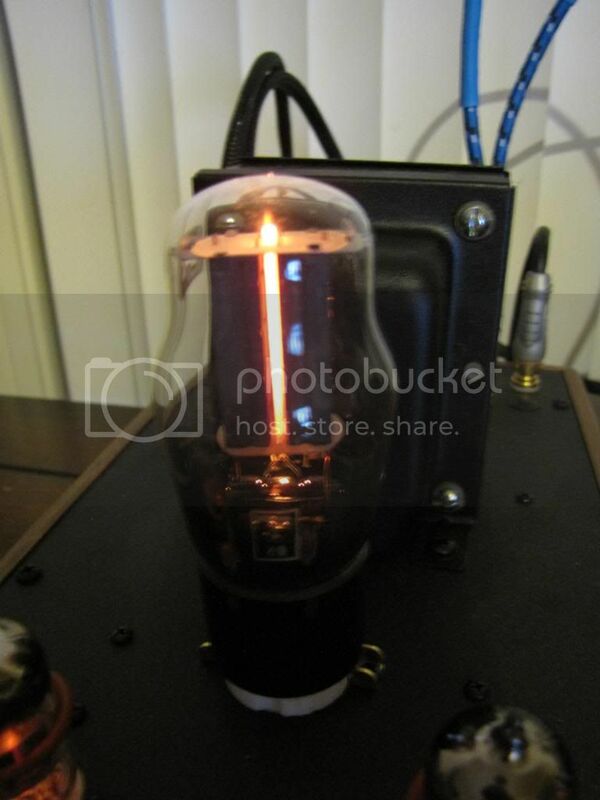 I will give rectifier changing a try with some poppy tubes later and see. Maybe Lord Soth (or another member) can educate us on the effects of rectifiers on the circuit??? So I put a barely used, high testing, well matched 67 Mazda/Dario E88CC/6922 in the output. This was with a very nice early 60s Siemens 6DJ8 input, and the 50s GE/RCA 5U4G-ST. Steady Noise, but not the crazy stuff. Then I put in some barely used Premium Telefunken PCC88s/7DJ8. The crazy noise stuff. Then some cryo'd Sylvania 7308s. Similar noise to the Mazdas but a little quieter. I think this is an improvement, but no good. So presumably my voltage reduction is helping. I left in the above tubes changing the rectifier. An early 50's RCA 5U4GB, Chatham 5R4GWY, RCA 5Y3GT, and Valvo 274B...all having a little different variation on the hum/noise, but noisy none-the-less. I hope Steve will give some insight, but for now, I am sticking to 6N1Ps and 6BQ7As. Well we all know that different rectifiers affect the overall sound even though they are used to do one job only and do not carry a musical signal. They supply the rectified ( ac ~ dc ) high voltage rail. I know there are some 600v caps in the circuit which the rectified voltage will pass through to take the rough edges, or ripple, off. The smoothing caps. Of course there will be a tolerance in the circuit where everything works ok even with small % above or below the desired V/A. Why some output tubes aren`t compliant with certain recs can only be down to the tolerance being just to far exceeded for the particular output tube. A mismatch ? The tube data fineprint may hold more answers. Until I read this thread I assumed the 3 signal tubes in/out would all be one type, matched, which is what I use..7dj8 B Boys in the CSP2+. In the ZP3 there is no confusion as the in/out tubes are different. Thanks Marky...I wonder now after my tests if the rectifier has much effect on this issue. Must be pretty much all about how the SRPP is configured. The oddity to me is that if the circuits of the CSP2+ and CSP3 are the same, why are some doing better with the 6922 types as outputs, and others not well at all. I just had a really good Mazda E88CC/6922 blow in my Torii that was NOS and only used maybe 100 hours by me. This was a few hours in the Torii after trying to use it in the output of the CSP3 for a few minutes, where it worked, but with noise. Like Funch, I am now worried that this circuit may be dangerous for some tubes. No technical knowledge to indicate this, and it may be a circumstantial quirk, but I am not putting in any more tubes in the outputs other than 6N1P and 6BQ7As until I know better. I believe Marky has provided a very good technical response. The rectifier alters the supplied DC and hence the circuit . The same tube will sound different when supplied with a different current. My experience with the CSP2+ is that the choice of input tube has a bearing on the final output sound too. Steve mentioned this too in one of his articles. Tube synergy is very important which I found out at great $$$$ . Yeah, tuberolling is expensive but I enjoyed it nonetheless. I've already have a working set of tubes for my CSP2+ Synergised for my current audio set-up. I really can't wait to transplant the exact same set of tubes over in my CSP3. Here's a chart of various rectifiers with their corresponding voltage drops. It is this voltage drop that changes the operating point of the tube. The voltage drop represents the voltage at maximum current draw. You won't actually get a 60-volt drop from a 5Y3 since you are only drawing around 80ma max. Note also the filament current draw for each tube. Your amp will run a little hotter if you are using 5u4g since it 's drawing 3 amps vs 2 amps for a 5y3. Yes, very interesting. Thanks all. I need to study the chart more, but I am so ignorant, I may need to ask for some translation to figure out what does what sound-wise, and how these values effect the tubes down stream. By the way...Not yet sure why electronically, but after looking at that rectifier chart, I recalled some Sylvania "Fat Boy" GZ34/5AR4s hiding in the back of my cabinet. I rarely liked them in my Torii, but Not So in the CSP3. With some Ediswan (BVA) 6BQ7As, and a great Siemens ECC88/6DJ8....Insane resolution without any edginess, spaciousness, ambient transformation to the room being recorded, gorgeous texture, extended dynamics/black, rich but tight bass, and that crazy seductive thing when a big drum head gets hit...you hear/feel the skin...no speakers at all...something to do with brilliant speed. Same with string bass...totally in the room...Wow. Course this is with the tubes in synergy with the Torii tubes and everything else, but Wow! Anybody try the 6106/5Y3 Bendix tube in the CSP 2+? I have tried it, labelled-Heinz and Kaufman, and I believe if you look back in this thread, you will find a post by Lord Soth about the tube, and I replied with a thought. I finally gave it a little listening time in the CSP3. It is a great quality, balanced, clean, transparent, and true tube, but not to my taste. I really prefer more spacious dynamics than the 5Y3s have to offer. It was made by Bendix and is very rugged as it was a military tube used in the US intercontinental missiles during the cold war. It is very clean sounding with Solid State sonics. I prefer a warmer tube such as the RCA or Tung Sol 5Y3. Thanks for sharing your insights about the GZ34. I also have a couple of those "hiding" somewhere in my tube cupboard. I never rolled them in my CSP2+ because the famous reviewer "Skylab" of the head-fi audio forum tube-rolled rectifiers before in the CSP2 and he concluded that the humble and much cheaper 5Y3 sounded way much better than the more expensive 274B or the GZ34. Perhaps the new CSP3 will bring about a renaissance of the GZ34? The other 5Y3s are pretty inexpensive too. Many seem to love them in their CSPs, I just have not gotten there myself. I used to roll 5Y3s in my Torii now and then. It always felt good at first, including the Bendix (excellent for bringing clarity to certain tube sets) but then something was always missing for me that I did not identify at first, but put back in some 5U4s anyway. By comparison to many 5U4G-STs, 5R4GY, and now with this particular 5AR4 back in, I think what it is with the 5Y3s I have is a sort of dynamic "veil" that I just can't get used to. But this is just me...I love dynamic sound and if I feel a need to temper dynamics, I would rather do it elsewhere than the pre, or a Rectifier for that matter. Perhaps a little warmer, softer input tube in the Torii, or maybe in front of the CSP. And since I am using a Torii, I am guessing a little of that saturation-"smoothing" tends to be one of the characteristics EL34 lovers like and part of my sound anyway. Could be just different tastes, and very likely a particular synergy...After the 5Y3, I bet that "Fat Boy" will be a bit big at first with all else the same. I find it a classic tube...deep, spacious...that big "tubey" sound revealing a lot in ambient areas (around instruments, and in the broader ambient decay), cradled in a little smooth warmth, and with bottomless seeming dynamics...I really am liking it. But I am a sucker for dynamics. I look forward to your sense of it. Is two weeks now the 6N1P-EV from Russia are in my CSP 2 and they sound wonderfull, no noise at all no hum. Being happy is what it's ALL about. Enjoy! I've had a pair of 6N1P from Cryoset in the CSP3 for about a week. It' a solid pair and most importantly very quiet. No buzzing or humming, etc. And sounds great. Thanks folks for the advice. It's good to have a nice solid pair in there and I'm not going to mess with anything else in the output position. I find plenty of "tweaking" with just the signal tube and rectifier. I thought it worth mentioning that the CSP3 really does well on it's own as a headphone amp, even with the LCD's. My Taboo 3 has been gone for a couple weeks, back to Decware for service. So I've been using just the CSP3. I wasn't sure how it would go as the CSP is supposed to be for more high impedance or dynamic headphones. A/B comparison with the Taboo confirms this...I certainly prefer the Taboo. Of course, the Taboo alone works better with the LCD's...it being designed with them in mind. The Taboo seems more dynamic and quick, light on it's feet for lack of a better description. Then...the CSP3+Taboo3 just is awesome. Very full, dimensional, and liquid sound with LOTS of fine tuning and tweakability with all the gain adjustments and tube options. It's pretty hard to beat. Anyway, with the Taboo gone I've been using just the CSP3 with the LCD's. Happy to report that even though it's not an ideal match, it really isn't a slouch with the LCD's. With the Mazda rectifier and a JAN Sylvania 6922 in the front, I'm getting some very enjoyable listening sessions. A little darker and more laid back presentation than the Taboo, with a maybe a bit less dynamic punch and a bit less bass presence. Still nicer than any SS amp I've had. I'd be pretty satisfied if I hadn't already been spoiled by the Taboo or CSP3/Taboo combo! My CSP3 finally arrived today!!! Some points I want to share. 1. The same tubes used in a CSP2+ can still be used. Can be used without any problems. I simply transplanted the same set of tubes over from my existing CSP2+. 2. A fresh CSP3 (with beeswax) is at least 2 notches higher in all sonic departments vs a CSP2+ (Without beeswax) seasoned over 1.5 years. Vocals have more "air" and emotion as a headphone amp. I paired my CSP3 with a Beyer 600ohms T1 headphone. 3. Preamp is even more transparent and emotionally involving. I connected my CSP3 to my SE based EL34 tube amp. My SE tube amp can work as an integrated amp or as a standalone output amp. Even my non-audiophile family members remarked to me that the sound sounded "clearer", I.e more transparent. For an external preamp to be able to surpass the transparency of the built in preamp section of an SE tube amp is an audio engineering feat! It also sounded "nicer and smoother", I.e more emotionally involving. The midrange has more "presence". I've played with tubes and the best analogy I can give is that the new CSP3 with beeswax has the glorious midrange of a Telefunken tube. When used as a preamp, the music simply grabs your attention like a toddler grabbing an adult for his undivided attention. 4. If you are like me, moving to a CSP3 from a CSP2, do not assume that the same input and output settings apply. On my CSP2+, I had to turn the input knobs to the maximum when paired with 600 Ohms headphones. This does not apply to the CSP3. I only had to turn the input knobs to the midway mark. The CSP3 seems to have more leeway with the volume control. In audiophile parlance, there seems to be more "useable power". Kudos to Steve and the rest of the Decware team for taking the CSP to another higher level! I'm happy to hear you're enjoying your new CSP3 and, for what it's worth, I agree with all your observations and recommendations. The Jupiter caps certainly do make a big difference. A few days ago, on the Head-Fi Forums, I had a PM from a member querying me about my opinions on the CSP3 and WA2 (since I own both). Basically, he wanted to know which of the two I preferred and why. After some explanation and the usual disclaimer (my ears are not your ears, etc.) I told him that while I could be happy with either, that I would ultimately select the CSP3 for it's versatility, clarity/transparency, sonic texture and power even though I think the WA2 is visually more appealing to me. The lifetime warranty and 30 day trial only make the decision that much easier. I also think the CSP3 is no slouch when it comes to powering my LCD-2.1 phones, although I generally use my Taboo III for that purpose. Had I purchased the CSP2+ (CSP3 didn't exist back then) before the Woo WA2, I seriously doubt I would ever have purchased the WA2. Yes, the Jupiter Beeswax caps make a sonic difference and are worth the upgraded price. I will send my CSP2+ over for the required upgrade in due time. On a side note, I love the industrial look of the Woo amps. They are all metal and solid and rugged. They remind me of an American M1 Abrams tank. Before I had ever heard of Decware, the Woo Audio tube amps were also on my short-list. I then came across the CSP2 review by Skylab over at Head-fi. He ranked the CSP2 as one of the top 5 headphone amps out of many amps including Leben, Schiit and Woo Audio amps. I am really glad to have taken the plunge into Decware based on his recommendation. I also look forward to receiving my Torii MK4 which is due to arrive around the end of this week. All you MK IV guys are making me antsy for my amp! I keep checking the list every couple days to see if Steve's worked his way through the MK IV lineup and started on the Mystery yet! I'm sure that your Mystery Amp will sound fabulous. Congrats to you on your free Red NOS caps upgrade. The waiting period will also have to include additional burn in of the new tubes and equipment. I was fortunate to have a ready set of seasoned tubes for my CSP3, so I could enjoy the sonics of the New preamp immediately. For my Torii MK4, it will probably take me another 2 weeks of normal usage before I can reliably judge the sonics. It is likely that I'll just skip my originally planned tube-rolling experiment and just pop in my NOS GEC Gray glass KT66. I trust Steve's judgement when he says that the KT66 is an upgrade over the EL34. I'll just keep my metal base NOS Philips EL34s as a backup.
" I'll just keep my metal base NOS Philips EL34s as a backup." Wonder if thats the first time in print for that quote? Quite a roll on the horizon ! Maybe the Mystery Amp MK2 version will use EL34s? you can get identical gold plated knobs at goodcomponent.com. you simply have to widen the hole from 3/16" to 1/4" with a drill. In case anyone is thinking of adding their own control knobs to the input and output adjustments. The new CSP3 solo input tube is located very close to the 2 input adjustments. It might create difficulties in changing the input tube if you install any extra knobs. In my case, on a new CSP3, the virgin tube socket is very tight. Coupled with my large palm and fat fingers, I already have a slightly harder ( vs the CSP2+) time changing the input tube. I therefore prefer to leave the input adjustments as they are. True, but as long as you stick to knobs that are no larger than 1/2" diameter, it's still usable. Too bad Steve wasn't able to allow more space between the input tube and three control shafts. I guess the circuit layout underneath, the dual headphone jacks and input selector toggle pretty much dictate cramped controls under the circumstances. I'm definitely not cut out to be a brain surgeon. I had a rather hard time installing the input tube without trying to knock the fragile glass side against the input control shafts. For this reason only, I prefer the spacious layout of the older CSP2+. Here is a volume knob that really would look nice on the black top of the CSP3. But diameter again maybe a problem just a bit over 3/4". If you guys have a good source for knobs other than parts express please post it. Sorry will not let me post links till I have 5 posted messages. Check out Banzai Music of Germany. Thanks for the link. There are a bunch of knobs here. Should be able to find some thing you can live with there.